As I previously mentioned, Jason Quinlan and I co-presented a poster at this year’s EAA in Istanbul. While it isn’t quite as brilliant as Alison Akins’ Plague Poster, I enjoyed putting something together about the photography at Çatalhöyük, especially with one of the primary photographers involved! Regardless, I’ve put our poster below. 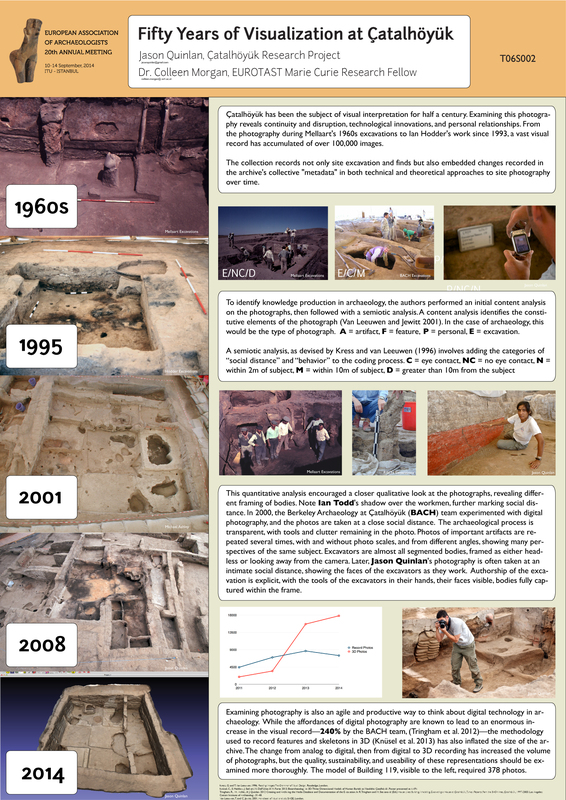 Of particular note is the immense increase in the size of the archive after Photoscan was introduced at Çatalhöyük. Jason and I collaborated on this remotely, and so there is some funny bits with converting between iterations of Illustrator, most notably in the wandering photo code above. What a great poster! Not only is it a fantastic investigation of the photos at this particular site, but it also made me think about my own thoughts/decisions when I take photos on site. I definitely consciously ‘stage’ some photos, either to make the site or the excavators look a particular way, that perhaps isn’t representative of the day-to-day practices on site. Which is possible an appalling practice, although I am certain (am I, oh gosh) that I am not the only one to do it. Hmm. Interesting stuff. I think I would add another dimension, which is that who is shown and who is making (or not making) the eye contact changes a lot about what any given image is communicating. There’s a tremendous difference, in terms of what an informed viewer reads out of a given scene, between a photograph where Ruth Tringham is looking at the photographer and a photograph where locally-based excavators are refraining from looking directly at the photographer — and that gets into some critical questions about power and who exercises it in archaeological excavation. As usual, turtles all the way down, reflexivity, operation of power in a post-imperialist world, we’re all embedded in the system, etc. etc. And the 3-D models are pretty slick, I admire those.